Let's face it, bacon is the holy grail of flavor. It's smokey, savory, salty and darn near perfect. It's hearty enough to be the main event and yet compliments nearly any savory dish when mixed in or sprinkled on top. Cooks have been looking for creative ways to incorporate bacon into their favorite dishes for years. Naturally, when the Pigchaser made his plans for bacon, it ended up in a BBQ sauce. Pigchaser Bacon BBQ Sauce is the real deal. Unlike some products promising bacon flavor, Pigchaser's thick, red sauce is loaded with real bits of bacon. Pigchaser skipped the chemical compounds that many products rely on for "bacon like" flavor. As with all his sauces, he stuck to real, all natural ingredients to create a sauce he can be proud of. This sauce is a thick honey, tomato base. The sweetness is typical of what I've come to expect from sauces produced in the Midwest. What's not typical is the fact that Pigchaser is HFCS free. Natural sweeteners like honey, brown sugar, pineapple juice and maple syrup provide Pigchaser Bacon BBQ Sauce with a multi-dimensional sweetness that I really enjoy. The bacon impacts the sauce on two levels. First, the chunks of bacon break up the smooth, glossy texture. The bacon content is substantial enough to feel on your tongue and in your teeth. The other thing that the bacon brings to party is a salty contrasting flavor element. All those sweet ingredients are begging for a salty compliment and bacon fits the bill. I thoroughly put this sauce to the test and enjoyed it every time. I first brushed the sauce on free range, Shelton Poultry chicken quarters as they finished smoking. The bright red sauce made a fantastic glaze. Both the flavor and appearance were excellent for smoked chicken. After enjoying the sauce on chicken, I had to pair it with pork. I brushed Pigchaser Bacon BBQ Sauce on rib tips this weekend. Once again, the sauce was superb. It really presented well on the pork. The sweet sauce complimented the smokey pork very well. The sauce also worked well as both a dip and burger condiment. 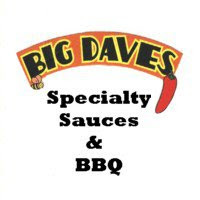 It's a great BBQ dipping sauce for fried chicken strips. It's also a fine sweet alternative to ketchup on grilled burgers. As the Pigchaser says on his labels, it's "not just for pork." Many products have used and marketed bacon flavor as a gimmick. 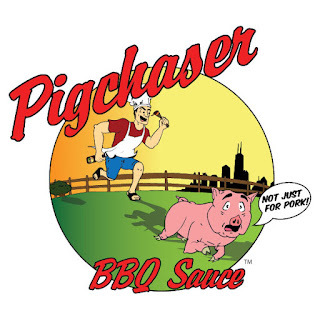 Pigchaser goes the extra mile to produce a sauce that is elevated above "novelty" status. Pigchaser Bacon BBQ Sauce is a quality sauce with all natural ingredients. It's unique enough to generate interest at your next cookout and delicious enough for daily use. To purchase your own Pigchaser BBQ Sauces, check out their website. See how Pigchaser Bacon BBQ Sauce rates on our "Product Reviews" page. 0 Response to "Pigchaser Bacon BBQ Sauce"